Authorities are concerned they may have to shoot the bears if they are unable to ward them off. BELUSHYA GUBA, Arkhangelsk Oblast — A Russian group of islands declared an emergency situation Saturday after it says dozens of 'aggressive' polar bears have 'invaded,' according to CBS News. The polar bears have made their way into inhabited areas of the Novaya Zemlya archipelago, which has a population of 3,000 people. It is currently illegal to hunt polar bears in Russia due to their endangered species status, but authorities are concerned doing so may be their only way to ward them off, according to the Independent. The Washington Post reports the bears have attempted to go inside office buildings and residential quarters, chased residents and have been "engaged in other aggressive behavior." The polar bears have been seen -- in photos and videos -- around homes, playgrounds, and even eating garbage. The arctic bears typically live on sea ice, hunting and feeding on seals. Scientists say as the ice has shrunk, the hungry animals have moved inland, coming into contact with human populations, according to The Washington Post. Since December, Russian authorities say 52 polar bear sighting have been reported, according to the Independent. 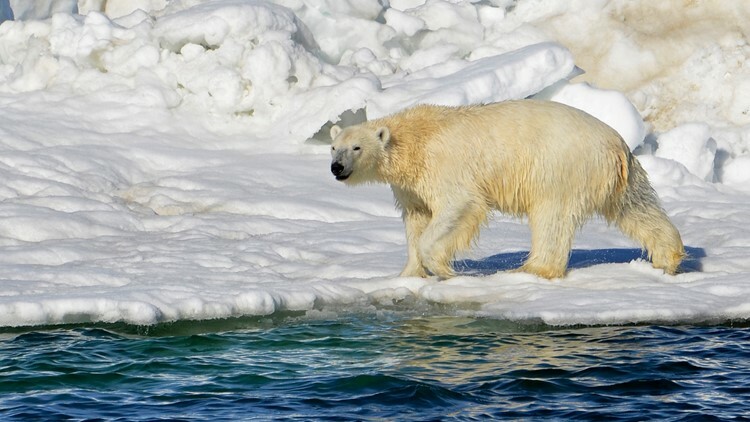 “I have been in Novaya Zemlya since 1983, but there have never been so many polar bears in the vicinity," Local administrative head Zhigansha Musin said.